Fax Voip T38 Fax & Voice - Fax Voip T38 Fax & Voice -Fax and Answering Machine for SIP/H.323/ISDN CAPI 2.0. Multiple SIP Registrations. Call Routing. Virtual Voice Fax Modem. Fax Voip Printer. Incoming Fax Routing: E-mail, Store in Folder, Print. Fax-On-Demand. Mail to Fax. For your fax or voice application, it\'s a Voice Fax Modem. You can setup your Fax & Voice program to operate with Fax Voip Virtual COM ports or virtual Fax Voip 14.4K TAPI Voice-Fax Modems. From the perspective of your VOIP internet network, it?s a SIP/H.323 client with T.38 and G.711 Fax support. From the perspective of your ISDN line, it?s CAPI 2.0 client with fax support. You can send/receive T.38 and audio (color/black-and-white) faxes and voice messages without any hardware, using your favourite Fax & Voice program. Fax Voip is the ideal solution for the implementation of Fax and Voice Mailbox into SIP/H.323/ISDN network. You can use Fax Voip with your VOIP or ISDN PBX or with your SIP/H.323/ISDN Provider. Up to 100 virtual modems can be used simultaneously. Multiple SIP Registrations and Call Routing functions make your system the most flexible and allow you to work with different SIP and H.323 providers simultaneously. Caller ID and Dial a Phone Number Extension features are supported. You can send T.38, audio and CAPI faxes via Fax Voip Virtual Printer and receive faxes directly in TIFF, PDF or SFF files. You can send audio messages. You can manage faxes and audio messages with Fax Voip Console. Fax Voip allows to send faxes and audio messages via e-mail (Mail to Fax and Mail to Audio) and receive faxes to e-mail (Fax to Mail). Fax on Demand function allow callers to retrieve information via fax on the same call. 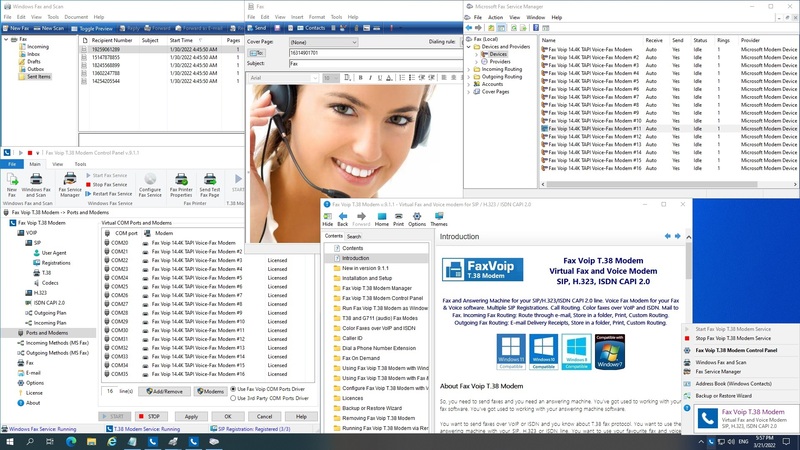 Fax Voip has been successfully tested with Microsoft Fax, BVRP Classic Phone Tools 9, FaxTalk Messenger Pro, CallStation and many other programs. OST to ANSI PST converter is one of advance ost2ansipst tool which easily recover OST to PST files and convert OST to ANSI PST into few easy clicks. Software firstly recover your corrupt OST file and then convert offline file to ANSI PST format. If you are looking for a solution to import/export OST to Outlook PST in one go? Here in this situation, go ahead with OST to ANSI PST Converter to Import/export, convert OST2ANSI PST smartly in one go. Fax Voip Softphone is a powerful and unique SIP / H.323 software telephone that lets users make phone calls, record calls, play audio files into the telephone line as well as send/receive T.38 and audio faxes from one single software application using any Voice over IP (VoIP) telephony provider. Music on Hold. Call Transfer. Call Forwarding. Phone Book. Log Book. Random Phone Calls. ABTO Software\'s VoIP SIP SDK for Windows is a solution to quickly build VoIP softphone that can dial and receive audio and video calls on your computer or add VoIP features into your software or web website. Our powerful and highly customizable VoIP client designed as ActiveX control and has wide range of features.